"The Downtown All-Stars of Red Bank LLC is a collective of local musicians and performing artists bound together to raise both funds and awareness for charities and worthy causes using the immeasurable power of music." Admission is $20 (vets & active duty service members - $10) which includes a copy of the new CD! Proceeds go to the Red Bank Elks Lodge Veteran's Charity. Further information regarding our new CD can be found on our Facebook page. 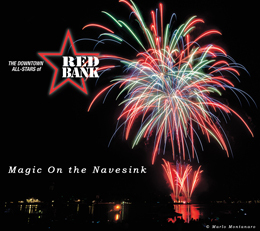 Preview "Magic on the Navesink" below at our Online Store, where you can purchase the physical album or download the Mp3. Also, be sure to check out our 2013 release, "Bright Lights on Broad Street", our initial compilation, featuring 16 tracks of some of the best local original music from Red Bank, that cool little town on the Jersey Shore. Why Donate to the Red Bank All Stars? Your generous gift will help The All-Stars continue their mission to uplift the community. Even small change can make a positive change in somebody's life."